Whether you are working in the USA or South Africa, dying without a will brings out all the forgers in the family. 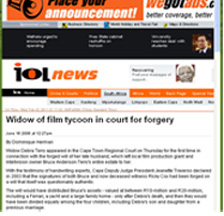 Widow Debra Terry appeared in the Cape Town Regional Court on Thursday for the first time in connection with the forged will of her late husband, which left local film production giant and Intellvision owner Bruce Anderson-Terry’s entire estate to her. With the testimony of handwriting experts, Cape Deputy Judge President Jeanette Traverso declared in 2003 that the signatures of both Bruce and now deceased witness Ricky Cox had been forged on a will that itself was questionably authentic. The will would have distributed Bruce’s assets – valued at between R10-million and R20-million, including a Ferrari, a yacht and a large family home – only after Debra’s death, and then they would have been divided equally among the four children, including Debra’s son and daughter from a previous marriage. Following the court case in which Traverso ruled that Bruce had died without a will, the estate was divided between Debra, Brett (Bruce’s son from his first marriage) and half-sister Kim. Bruce’s stepchildren did not inherit anything. Thursday’s court appearance was the result of an investigation into the forgery, ordered by Traverso three years ago for a possible criminal prosecution. Magistrate Vic Gibson ordered that Debra – wearing a black leather jacket and high heels with her auburn hair cut into a short bob with chunky blond streaks – appear again on July 21 when a court date would be arranged. Gibson said the time would allow for Debra’s defence to gather “further particulars”. Public prosecutor Jannie Knipe said yesterday that Debra had not yet been charged, but she knew the allegations against her. According to the charge sheet, a main charge of fraud is listed along with a first alternative charge of forgery and uttering and a second alternative charge of contravening the Administration of Estates Act. “… the accused when she gave out and pretended … knew that in truth and in fact that the document described as the ‘Last will and testament of Bruce Anderson-Terry and Debra Helen Anderson-Terry’ was in fact not signed at Claremont on 24 February 1999 by the late Bruce Anderson-Terry and the accused as their last will and testament,” the main charge states. Bruce died, aged 52, in a car accident five years ago this month. Well known as a major player in the local movie-making fraternity, his film facilities company, Intellvision, was housed in a gracious old Cape homestead in Mowbray.